Her Excellency Marta Kos Marko has been Slovenian Ambassador to Germany since May 2013. 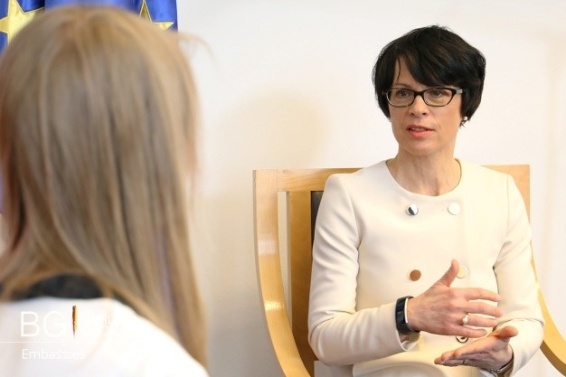 She started her career as a journalist then went on to become a correspondent for the national television in Germany, and then Vice-President at the Slovenian Chamber of Commerce and Industry and also worked as a management trainer. It is quite an interesting past I would say, what you have mentioned now. It was really a coincidence that I became Ambassador. I was asked by Mrs. Alenka Bratušek, the Prime Minister at that time, because Slovenia did not have an Ambassador in Germany for nearly 2 years. She knew I had been dealing with Germany all the years since being foreign correspondent in Bonn at that time, but it was not so easy, the decision to transition to work in the field of diplomacy, because at that time I worked at my own company. I had never dreamt about becoming a diplomat or an Ambassador, especially an Ambassador in Germany. It was all very coincidental, and some could also say good luck, and probably the experience that I had at that time working with Germany helped me as well. Germany is Slovenia's most important trading partner - nearly a third of Slovenia's total trade is with Germany. How important do you think the role of being the Slovenian Ambassador to Germany is? It is very important, since we are a small country with a population of only 2 million and 20.000 km2 and at the same time being a strong economic partner to Germany. As you have mentioned, the numbers are good, but in total Germany is doing business with more than 200 countries and according to the amount of the money made in exchange of goods, meaning exports and imports, we are on the rank 38, which is a really good position. So you can imagine that there is a plenty to do on the economic field of work, public diplomacy, and cultural diplomacy or political. And since we are facing with crisis, before the financial and now the refugee crisis, there is so much to do here in Berlin. And you can imagine, being Ambassador to Germany and at the same time non residential Ambassador to Latvia, is never boring. How would you define Cultural Diplomacy, and what does it mean to you? For me cultural diplomacy is kind of soft power we use in bilateral or multilateral relations. It can be almost everything. It is also the way I do the presentation about Slovenia here in different institutions. In addition, it is cultural events we are organizing here, the exchange of students we are having, cooperation between scientific organizations or Universities and under the line it is a culinary evening we are organizing in Berlin or in Stuttgart for the local community, with the goal to let them know and taste, what is going on with Slovenian culinary. So I think that cultural diplomacy is really a broad area of actions that we can do to promote our country in Germany in a very good way. How can we use cultural diplomacy to strengthen the relations between Slovenia and Germany? I was always asked what the connection between Slovenia and Germany is and I always love to stress at the beginning, that oldest written document found with the Slovenian writings was found in Freising in Germany. It is now in the library in Munich, meaning that connections started over a century ago. But on the other hand, also our mentality has at one part certainly something to do with the German one, so the number of translations in all the languages, the German language is on the first position and somehow it is the area of the middle Europe, which connects us a lot. Meaning, let’s say 60 % of the Slovenian population are able to communicate in the German language and this is really a huge percentage. Even my parents, born in 1931 and 1932, had to go to the German school during the Nazi period, but now they are speaking German because of that. I grew up near the Austrian border and it was quite normal for us to learn the German language as well. And this is one of the advantages we have with a population of only 2 million. Of course on the other hand, Germany is open to everything that is coming from abroad, and German people want to learn something new, meet new cultures from countries that they do not know so well. So in my opinion we really have plenty to do and plenty to offer. Considering that you previously worked in journalism, what is your opinion on the relationship between cultural diplomacy and propaganda? Do you think they have any commonalities or differences? First we could discuss about the expressions we use, propaganda and other, but if the goal of cultural diplomacy is to promote, let’s say Slovenian culture towards Germany, it could also be a kind of propaganda in the positive sense of the word. It is more about the exchange. But of course if I speak very well about my country, which I do in my presentation, do I make propaganda for my country or marketing or public relations? Anyhow I do all this. But under the line, I think this is a task of every Ambassador, every diplomat, to promote the country we are from. I am very happy that our government took a decision a month back, that we will open the new Slovenian cultural center here in Berlin, we only have one till now, in Vienna and the second one will be here, so we will have a lot of opportunities to promote not only Slovenian culture, Slovenian language, but Slovenia as a whole. What advice would you give to young people who are thinking about entering into the diplomatic field? It is one of the best careers you can have in world. It is very interesting, but you have to love it. If you don’t love to go around, if you are not passionate about networking, if you don’t like to be present and use social networks, if you don’t like to jump from one subject or theme to another, than this is not the work for you. If you love everything, which I have named, then is really great work to do. Not only in the bilateral relations, being now an Ambassador to Berlin, I have the possibility and privilege to meet other 82 Ambassadors from all around the world. So this is one of the advantages too, and working as a diplomat in Germany it is really privilege and great opportunity since the role of Germany in the world is changing in the latest year so much. Back to your question, to people in young generation just go for it if you feel that you have that kind of spirit and the passion for it. As I have said before, I come from a small country, but not even once in Berlin I have felt bed, because of it. Germany has 41 times more inhabitants than Slovenia and it is nearly 18 times bigger than Slovenia. But not even once I got a feeling that I was treated differently or bad because I am coming from a small country, so this is one point and the other is, Berlin is really something special. Since I have lived in Cologne for nearly 8 years, at the beginning of the 90’s, the Germans have changed so much. We are used to say that Cologne is not typical German, but Berlin is not typical at all. Not only because of many people from abroad but also because of the spirit. I feel that everything is possible here in Berlin. If you like to have diversity in culture just go for it, if you want to have diversity in culinary go for it, if you want to meet different people just go for it. So in Berlin everything is possible. And I like it a lot.